United Way and Program International , Procam International in association with Hyderabad 10 K Run Foundation organised 10 K and 7 K Races on the Necklace Road in the early hours of 25th December 2012 . It is not only Run about health and fitness , but also for the cause of the needy , with the solidarity shown by the Corporate Companies supporting, identified Non governmental Organisations.The Organizers of the Event were instrumental in collecting contributions from these companies, for the activities being conducted by the NGOs for the welfare of the community. Tharuni is one of such NGOs identified , which was privileged to actively participate in the 7 K Maza Run from People's Plaza to Sanjeevaiah Park. Half a dozen of Koya tribal boys from Eturunagaaram in Warangal District, represented Tharuni in their traditional attire, attracted the people. Dr Mamatha, Executive Director, Raghuveer, Surekha Adimulam, Thyaga Raj Kovvali and Ailesh , from Tharuni have actively participated in the event. Tharuni was supported by Franklin Templeton India Services Ltd. identifying Tharuni working for the Girl child. Students from educational institutions and Employees from other companies like Fact sheet Ltd. and I Spice supported Tharuni by wearing the T-Shirts provided. The slogan on the T-shirts 'Save the Girl child" went through strongly during the Run. Tharuni distributed its new Brochures to the participants. Walkathan Rally was conducted by Child Welfare committee and Child Line 1098 as part its Weekly Celebrations on child protection , from Police Head Quarters to the District Collectorate, on 20th November 2012, from 7 A.M. I/C District Collector Pradyumna was the Chief Guest to inaugurate the Walk. District Superintendent of Police, Rajeev Kumar was the Guest of Honour , who joined the gathering in the Walk, and spoke on the importance of rights and freedom of children to lead a healthy and rightful life in their childhood. C. W. C Chair person Dr. Mamatha Raghuveer, highlighted, that the children can contact through the toll free number 1098 , when they are in distress. Child Line Coordinator Sudershan explained about the child line in detail, to the gathering. Juvenile Justice Board Member Renuka, CWC.Members Chakradhari, Thirupathi and Revathi Devi, Tharuni, Pragathi Seva Samithi, MARI, FMM,all Non Governmental Organisation Members, Police, I.C.D.S. officials, Anganwadi Workers, NSS volunteers ,along with their Coordinator Dr. Suresh B. Lal from Kakatiya University, Students from schools and colleges , more than five hundred people, participated in the Rally. Tharuni and CWC jointly felicitated the persons who helped and saved , rendering outstanding services to the children, with ' Bala Rakshak' Mementoes, and shawls. District Collector and Superintendent of Police were also specially honoured for their concern and great service for the child Protection. All the participants took part in the signature compaign and oath taken for child protection. Dr Yerra Sridhar Raju, Psychiatrist – For his continuous services to children who need Psychiatric care & for taking up developmental activities in Children Home for Boys, Autonagar, Wgl. Mrs Madhavi, Counsellor, ICPS, Dept of Women & Child Welfare – for stopping child marriages and reintegration of trafficked girl. Mrs P. Mamatha, Team Member, Child Help Line – 1098 – for her services in rescuing abused girl Baby Pujitha from Kazipet Railway Station. Mrs Malathi, Anganwadi Worker, Village Ameenapur, Kesasamudram Mandal – for her services in rescuing a beggar girl in the railway station. Mrs Yashoda, Anganwadi Worker, Village Upparapally, Kesasamudram Mandal – for her services in rescuing a beggar girl in the railway station. Mrs Ramaleela, Director, Mallikamba Manovikasa Kendram, HNK – for her services in giving shelter and protection to Mentally retarded, Deaf & dumb girl Baby Gudia. Mrs - Sister, Neo Natal Ward, MGM Hospital, Wgl – for her services to Baby Manavi, amputated girl rescued from Kzpt Rly Station. Smt Mallamma, Ayamma, Sishugruha, Hnk – for her services to Baby Lakshmi who was operated for her legs. Tharuni Gurukul celebrated children's Day and Birth Day of Cha Cha Nehru The First Prime Minister of India after Independence, in the Branch Library campus , Nagarjuna Colony, Champapet, Hyderabad, on 14th November 2012. Gurukul Students participated in the celebrations actively. Dr. Hemalatha, coordinator of the Gurukul conducted competitions to the children, in Essay Writing, Drawing, songs , Musical Chairs and Rangoli. Mementoes and Prizes will be given to the winners on 18th, as part of the Library Week celebrations from 14th to 20th November. The senior students of the Gurukul, students from neighbouring schools,Library Officials also took active part in the event. Tharuni has released a Pamphlet on the International Girl child Day, about the main issues Girl child is facing in India. Let us all form into a Net Work to solve them in our day to day life. Click on the link above to see the pamphlet. Tharuni celebrated the first International Day of Girl child initiated by the U.N.O. on 11th October 2012. A special issue of Tharuni News Letter was released by The Minister of Women and Child Welfare , Government of Andhra Pradesh, Smt. Sunita Laxma Reddy, in her camp office Hyderabad. Dr. Mamatha Raghuveer, Director , Tharuni appraised Smt. Sunita about the status of Girl children. The Minister praised the efforts of Tharuni , to develop the girl child in the State. The News Letter identified the problems of girl child, particularly the discrimination against her and how to overcome it. Evening , Dr. Hemalatha, Retd. Professor, and Joint Director , Tharuni, released the Pamphlet on the Importance of International Girl child Day in the Administrative Office of Tharuni. Dr. Mamatha, Executive Director, and Coordinators of Tharuni, and girl children attended the event. News letters and Pamphlet were distributed to the community. The P.N.D.T.National Monitoring Committee Member Smt. Asha Singh, visited Warangal District on 21st September, along with Members kalpana, Anuradha,and Mandakini. According to 2011 Census there is low ratio of girl children below the age of 6 years in this District. So a Compaign "hak hai jeene ki" is being initiated very soon, to save the girl child, they said. Tharuni Executive Director, Member of the Advisory Committee, P.C.P.N.D.T.Act, Dr. Mamatha Raghuveer accompanied the Committee to Devaruppula Mandal, and they met the Tribal women in" Dharaavath Thanda" to discuss on the issue. Later Asha singh also visited a Nursing Home in Jangoan to see the records on infanticide, and another private Nursing Home in Sayeem nagar in the head quarters. The committee met District Collector Rahul Bojja, D.M.H.O. Dr. Sambasivarao, to discuss the issue of initiating the compaign. Tharuni enabled training program in computer education for 42 adoloscent young women for the last two months, under Rajeev yuva kiranalu, Government scheme, and 35 girls got appointments in corporate sectors. The girls are also trained in karate,sspoken English,and personality development skills. New batch is also started last week. Tharuni in collaboration with UNICEF and Rajeev Vidya Mission organised Balika Mela (girls' Meet ) on 26th, at Geesukonda Mandal , Warangal District. Four hundred girls belonging to Balika Sanghas attended the Meeting. UNICEF coordinator, MPDO, MEO, ICDS Extension Officers,attended the Meet along with Anganwadi workers and Supervisors.Dr. Mamatha, Director Tharuni while appreciating the active participation of the girls in the development of their villages, distributed mementos to 20 best Balika Sanghas. She also gave Appreciation Certificates to thirty girls who passed their xth (Tenth) standard with more than 500 marks. The Speakers encouraged the girls to continue their group activities, contributing for the welfare and development of their villages, while educating themselves. అమ్మ ఎంత తీయనిదీ పదం. ఆత్మీయతకు మారు పేరు అమ్మ. అనురాగానికి ప్రతి బింబం అమ్మ. అమ్మకు అమ్మనయితే గాని అమ్మ ఋణం తీర్చుకోలేనిది. మా అమ్మ సూర్య కాంతమ్మ .సినిమాలో సూర్యకాంతం పైకి ఎంత కోపం నటిస్తుందో అంతకన్నా పదింతలు వెన్నలాంటి మనసున్న మా అమ్మ . మా అక్కలిద్దరికి బాల్య వివాహాల వల్ల కలిగిన కష్టాలతో అంతులేని దుఖం కలిగిన అమ్మ నన్ను కనీసం ఆంద్ర మేత్రికులేషణ్ పరీక్ష అయినా రాయించాలని తహ తహ లాడింది . స్చూలుకే వెళ్ళని పరిస్థితులలో ఆమాత్రం చదివితే నయమని, ఐదో క్లాసు వరకే చదివి , పదేళ్ళకే పెళ్లి చేసుకోవాల్సి వచ్చిన మా అమ్మ. అమ్మతోపాటు నాన్న కూడా ఇచ్చిన ప్రోత్సాహం తో పన్నెందేల్లకే మెట్రిక్ పాసయ్యాను . అప్పటినుంచి డిగ్రీ దాక పూర్తి చేయించారు 18 సంవస్చరాలకు ఊరిలో బి ఇది ట్రైనింగ్ లో చేర్చాక అమ్మకు భయం వేసింది అమ్మో పెళ్ళిచేయాలని , ఎందుకంటే ఆమెకు అప్పదికే గుండె జబ్బుతో ఎలా ఉంటానో అని, నాన్న చేయగలరో లేదో అని భయంతో ట్రైనింగ్ అవుతుండగానే పెళ్లి చేసిన అమ్మ ఏడాది తిరగకుండానే చనిపోయింది. 55 ఏళ్ళు వచేదాక పిల్లలు, మనుమలతో కలిసి చదువుకుని పీ హెచ్. డి. చేసి ప్రొఫెసర్ గా రిటైరైన నేను అమ్మ స్పూర్తి తో నాకున్న ఒక్క కూతురితో పాటు ఎ ఆడపిల్ల కనపడిన చదువుకొమ్మని చెప్పుతూ వేలాదిమందిని చదివించ గలిగిన నాకు అమ్మే అంతర్జ్యోతి. అల్లాగే నా మమత కూడా అంతం లేకుండా సంపాదించిన , సంపాదిన్చుతూ ఉన్న డిగ్రీలు ,నేను ఆమెలో కలిగించ గల్గిన అమ్మ స్ఫూర్తి కి తార్కాణం. అంతేకాదు ఈనాడు మమత వేలాదిగా బాల్య వివాహాలు ఆపుతున్నపుడు, బాలికల ఉన్నతికి ఎంతో శ్రమ పడుతున్నపుడు , నాకు కలిగే తృప్తి, ఆనందం మాటలలో చెప్పలేను. మా అమ్మ రగిల్చిన ఆ జ్యోతి కలకాలం అమ్మలందరిలో వెలిగి , ప్రతి బాలిక చదువుకుని, తన పిల్లలతోపాటు , పదిమంది బాలికలు చదువుకుని , విద్యావంతులైనాకే వివాహం చేసుకునేలాగు ప్రయత్నం చేయగల్గితే నాజన్మ ధన్య మైనట్లే. Tharuni Director & CWC Chair Person Dr. Mamatha Raghuveer attended the Crime Meeting of Warangal District Police, presided by the Superintendent of Police Rajesh Kumar on 14th April and made the following Presentations along with others. Children need to be protected from their vulnerability by the whole society, especially the Police. 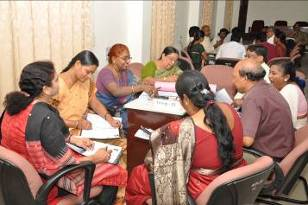 Center for Women's Studies, Kakatiya University, Warangal, organized a two day National Seminar on Gender Issues:" Empowerment of Women" on 17th and 18th March 2012, in the Campus.Dr. Mamatha Raghuveer, Executive Director, Tharuni was invited to speak on social issues of infanticide and child marriages.Vice Chancellor. K. U. Prof B. Venkatratnam was the Chief Guest for the Seminar.Dr. Jenneke Arens, Social Sientist Netherlands, Dr. Vidyavathi, Mohd. Iqbal Ali, Former Vice Chancellors, Prof. B. Vijaya Lakshmi Former Dean, Law College, Dr. B. Vijaya Bharathi Former Director, Telugu Academy were special invitees. Dr. Mamatha stated about the lowest girl child ratio in Warangal District where female infanticide is rampant. She requested the educated elites in the district to compaign against this issue among the public, particularly the rural people. Prof. Manuja Devi, Director CWS, and Professor of Economics explained the activities of the center. A souvenir was released with the abstracts of papers submitted on the occasion. 08-03-2012:-Internationally renowned Organization, which is serving the needy people, 'She' Foundation headed by Dr. sunitha Divya Raj and 'Aswamedha Foundation jointly celebrated the International Women's Day at Bharathiya Vidya Bhavan ,Hyderabad on 8th March 2012. 1st Lady of the State Her Highness Smt. Vimala Narasimhan, Dr. Gita Reddy Minister Govt. of A.P, Justice Chandra Kumar, Judge, A.P. High Court , B. janarthan Reddy.I.A.S; Srinivas, Andhra Jyothi Editor, Chillara Bhavani Devi,Writer were the Special Invitees for the occasion. More than fifty women who have excelled in different fields including health, Education, Media channels, social service were felicitated, with festive look.They include Dr. Mamatha, Director Tharuni organisation.The whole Tharuni Team, including Mamatha thank the Organizers for recognizing the services performed by Tharuni for more than one decade against child marriages.The honour really burdened Tharuni to do more services to the needy girls and women. 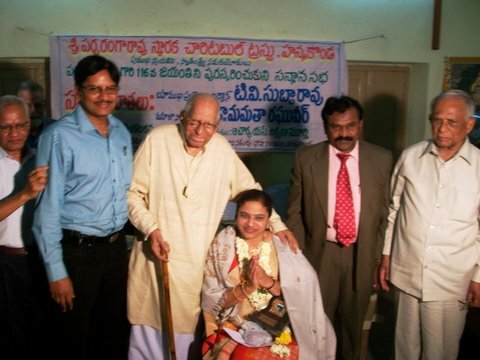 11-03-2012:-Sri Parcha Ranga Rao Smaraka Charitable Trust,Hanamkonda on the occasion of 116th Birthday of late Rangarao,Advocate and a patriot, felicitated Vidwan Sri T. V. Subba Rao a great Educationist and Dr. Mamatha for her sincere services to the society, on 11th March at Sri Raja Raja Narendra Andhra Bhasha Nilayam. Prof. B. Venkata Rathnam, Vice Chancellor, Kakatiya University, Bar Association President Rao Amarender Reddy were the Special invitees to the occasion., presided by retired Prof. S. Lakshmana Murthy garu. PRSCT Secretary Parcha Kodanda Rao, Trustee Parcha Mohana Rao organised the event in a befitting manner. Dr. Mamatha expressed her gratitude for the felicitations by elders as a blessing and honour given to her. It enthused her zeal to do more services to the needy women. GVN Bharatha Lakshmi, 5th Addl.Sessions Judge was the chief guest for the occasion.Dr. Mamatha Raghuveer, and Dr. Shobha Prof. in Pub. Admn.K.U. were the guests of honour.Dr. Mamatha in her speech stressed the need to develop life skills and human values as the youth are reaching their target in education,so that they can lead a peaceful and happy life. Another event for the women in Central Jail, Warangal , was attended by Dr. Mamatha, wherein the women prisoners celebrated Women's day.She could touch their heart, by highlighting the importance of discipline, correct decision making and human values in their life.She advised them to best utilize this time for concrete progress by improving vocational skills, so that they can lead a peaceful life.Jail Superintendent, officials, Police and inmates attended the program. International Women's Day Celebrations- March 2012. 01-03-2012:- International Women's Day Celebrations are being held almost for the whole month of March.Each and every Department of the Government,Public sectors,Banks, Educational Institutions,non governmental organisations and private agencies are celebrating the event with full zeal and enthusiasm.It proves that Women are excelling in all fields,on par with men and men are equally participating with women in these celebrations. Tharuni Director Dr. Mamatha was invited as chief guest on 1st March by Kasturba Gandhi Mahila Mandali, Narsampet, a 53 year old organisation, serving the cause of women, with different activities and training programs.Dr. Chamarthi Usha Rani,President of the organisation, Dr. K. Sri Devi, Professor in Political Science,Mahila College, officials, non-officials and many women participated in the event.Dr. Mamatha stressed the need of net working among women to build a bright future for the country. 06-03-2012:-The District Police and Tharuni jointly celebrated Women's Day in A.S.M. Degree & P.G. College, Kareemabad Warangal on 6th March. Dr. Lavanya Naik (Medcal Doctor), working as D.S.P.made a touching presentation on the crime against women.She advised the students and young women to not to take hasty decisions and requested them to reach their goals before entering wedlock.Dr Mamatha, Director Tharuni advised them to compete and excel with men in all fields.She also said that all women should unite to assert their rights.. They must have educare ie:not only learning the curriculum , but they also should learn life skills to reach their goals. College Principal Dr. Vidya Raniand all Faculty members participated in the event, which was telecasted in Sapthagiri Channel. Tharuni was given a rear opportunity to get Sandhya adopted by Dr. Mamatha and Raghuveer married to Gannarapu Ravinder (B.Ed; M.B.A.), son of Lingamma and Swamy at Huzurabad in Karimnagar District on 12th February 2012. She was at Balasadan of Social Wefare Board at warangal along with her sister and got educated. Sri Raghuveer had donated Rs.10000/- for her marriage expenses. We all wish you long and happy married life Sandhya and Ravinder. Tharuni profusely thanks State Bank of India for giving the opportunity to serve the Girl children, by donating a 12 seater School Van, as part of its Community Service, on 17th February 2012. Farooq Saheb, General Manager, SBI, Addl. General Manager B. Shankar, Deputy General Manager Smt. Manju Agarwal and Vaddepalli Branch Manager Vijay Kumar have handed over the Vehicle to Dr. Mamatha Raghuveer Executive Director , Tharuni, at the Arts College Auditorium. Dr. M.Rajagopalachary, Principal, Arts College, I.C.D.S. Deputy Director Smt. Mary Grace Kumari, Warden and Teachers and children of Balasadanam, Govt. Home for children and the Media Reporters graced the occasion.Dr. Mamatha felicitated the Bank Officials with Cheryala Paintings while thanking them, for their gesture and concern to do service to the community. Farook Saheb , stated that State Bank of India is allocating one percent of their profits for the social service. He also said that 77 Branches in the District have donated ceiling fans to Govt. Schools. Smt Manju said that Tharuni is doing service to the Girl Child. Education for women develops the whole family. Shankar had handed over the Van keys to Mamatha. Vijay Kumar had given blankets to the Bala Sadanam Children, who are the immediate beneficiaries to go to their Schools in the Van.Dr. Mamatha assured that the Van will be best utilized with the cooperation of ICDS officials and the Bank for the transportation of Rural Girl children. 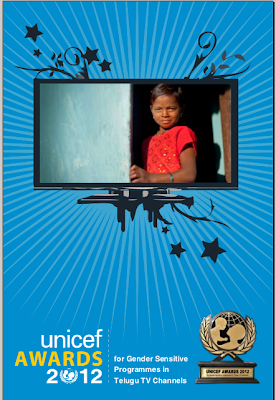 UNICEF Awards 2012 for Gender sensitive Programs in T.V. The Center for Media Studies in collaboration with UNICEF held the Awards Function For the third consecutive year at Hyderabad on 6th February 2012. Fifteen popular Telugu TV channels, reflecting their commitment to social concerns, focused 93 hours of their prime time with 702 programs on various issues of girl child.The Jury of experts finalized the selections after the CMS scanned the recorded programs.The recommendations by one of the Jury Members, Dr. Mamatha were already given in the earlier Blog of Tharuni. UNICEF through these awards, is keen to highlight the issues of girl child on different channels, so that it will have an impact on the minds of he people. Tharuni congratulates all the Telugu T.V. channels for their wholehearted efforts to bring out problems of girl child before the viewers. Let us hope this initiative of UNICEF may provoke all Media Channels of communication in all languages, to relay the issues as well as the solutions for the better status of the girl child. Tharuni's appreciation to the Center for Media Studies for their dedicated efforts to make the program a grand success. 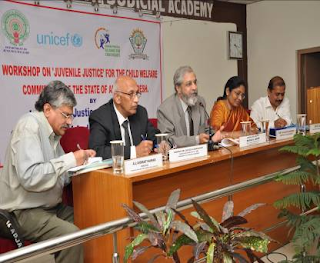 National Girl Child Day was celebrated organizing a Press Meet on 24th january at Hyderabad by the Child Rights Protection Forum Representatives including R. Venkat Reddy of M.V. Foundation, Dalit Leader J. B. Raju, and Dr. Mamatha Raghuveer of Tharuni and others.They demanded the Central Government for declaring 2012 as Year of Empowerment of Girl Child. They all reiterated to protect the rights of the girl children as they are facing discrimination with female foeticide, infanticide, child labour, child marriage and lower levels of education. They requested the Government to establish a Child Rights Commission at State level, to solve these problems.They also stressed the need to release Rules and Regulations to the Child Marriage Prohibition Act 2006 very soon. Free Education up to Degree level, free transport facilities, educational scholarships and free hostel facilities and toilets and sanitary requirements have to be provided to enable the girl child to empower herself, they said. Posters and Pamphlets were released on the issues of girl child on the occasion. Dr. Mamatha highlighted the issues of girl children on Vanitha T.V. and Sakshi T. V. which were telecasted on 24th January. There was lot of competition between the channels for telecasting Girl child related subjects. But except one or two no one has put an effort to show the ground realities. Most of the scenes were down loaded from You Tube or they have used forieng national photos for depicting the A.P. Scenarios. Hence, from next year onwards, we should give clear guidelines to all channels to not to show You Tube shots or downloaded pictures. Secondly, the Channels have taken up three or four major issues and showed only the negetivities. They had not shown any solutions to the problems. Media is an effective communication tool and can suggest solutions for the problems and save their lives. Next year we should tell them that proper research should be done on each topic chosen by them and suggest solutions / learnings for the viewers. There was no single nomination for well researched program this year as no entry was up to the mark. The channels should use external research agencies / individaul researchers for picturising such in depth topics. Next year CMS can plan a booklet with comprehensive details about Girl child issues to all channels well in advance. This booklet can also give the last year Award winning stories, so that it becomes a Guide for the new Producers & Directors. The Time period for this Awards can be extended to Six months so that it becomes a Habit for Media Cheannels to focus on girl child issues. The Time slot can be extended to six hours to capture all the programs which are gender sensitive. Most of the channels which are competing for the Awards do not reach people and only 3 or 4 channels can be viewed by the rural masses. Hence, recheability also should be a criteria for giving Awards as through this effort we want to reach masses with good messages on girl children. The Jury had observed negativism had become part and parcel of Media. They are not focusing the positive facts about the realities. Hence, awards were given to channels which are positive in attitude & Gave messages which are practical.